Yes, that has to be it! I see the tropical glow. Lolo’s Seafood Shack entrance. Ladies Night Out. 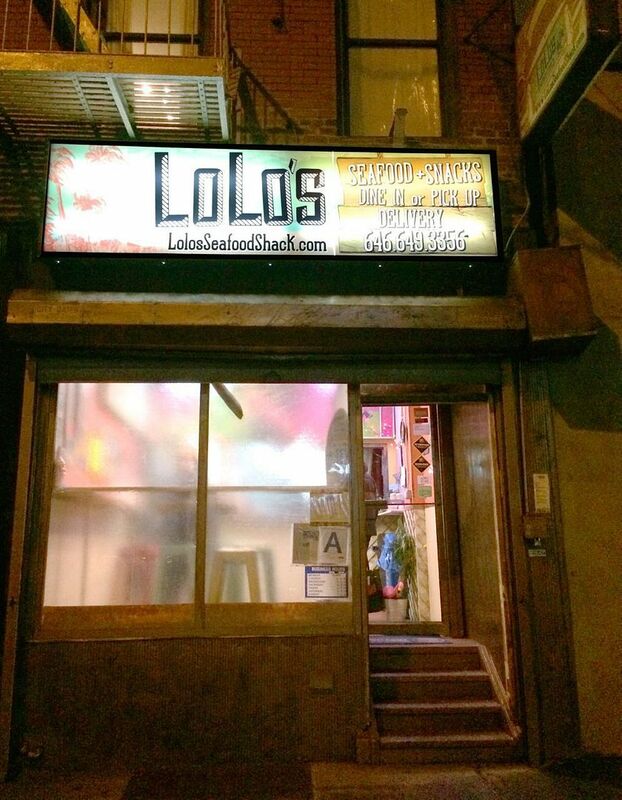 We agree to meet at Lolo’s Seafood Shack in Harlem and grab a table. 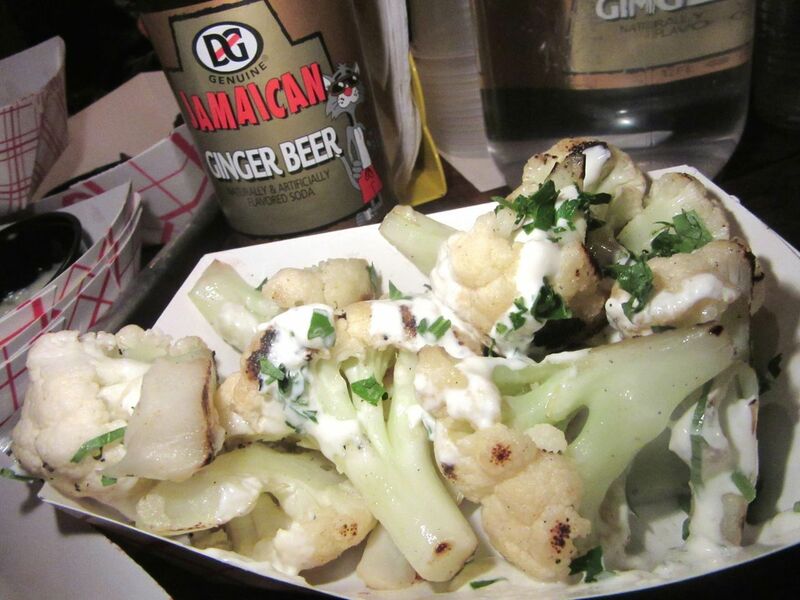 It’s a breezy wet night and we crave a little Caribbean. My pal Vicki wiggles her car to the curb out front and pretends it’s parked a safe distance from the fireplug. Diane and I run inside. For some inexplicable reason, I’m drawn to this hapless flamingo caught in this pot. The guy at the order desk tells us there’s a private party in the back room. We grab the tall table upfront in the window, pull up birthday balloon-hued metal chairs and stake our claim. I figure no one will make us move with a big enough order and an ostentatiously generous tip. Neighborhood fans stop by to order takeout. They would wait on the tall stool we’ve confiscated. 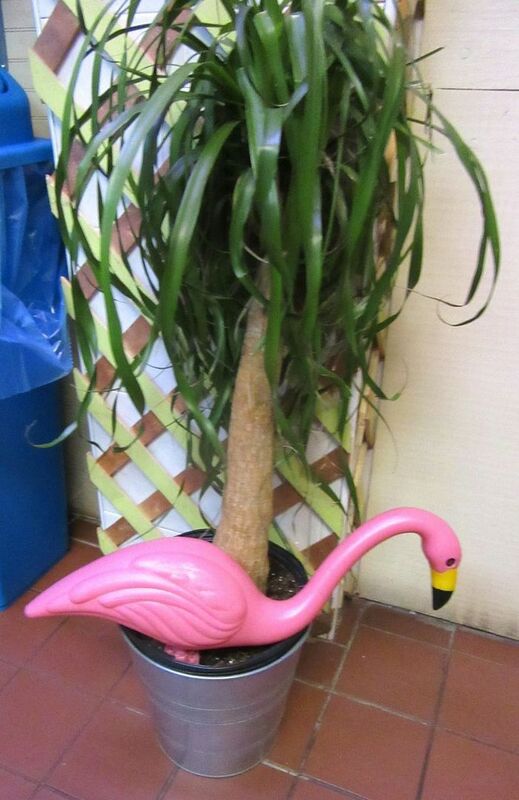 It’s easy enough to forget the bluster outside, given the island beach shack do-it-yourself signage on blocks of green and shocking pink, and the plastic flamingo standing in a plant. A trio of locals steps ahead of us to order takeout. I eavesdrop to get the vibe, then order, surrendering my credit card. Seems like the natives here are pretty high tech. I sign the iPad with my finger and get the hoped-for gasp when I specify my tip. A banana daiquiri I loved too much on my honeymoon would be ideal but the ginger beer is fine. I longed for a pineapple daiquiri, like I had too many of on my honeymoon. But LoLo is demurely PG. (They are awaiting their license.) 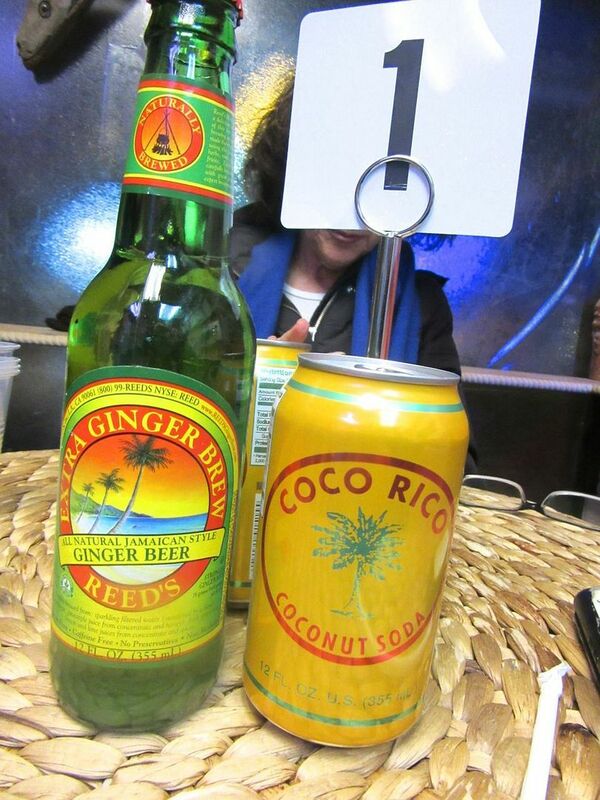 The house offers two brands of ginger beer and coconut cream soda and woven place mats while my pals study the menu to make sure my choices cover their cravings. Items $4 to $19 (for snow crab legs). Soon enough our order arrives on paper plates. 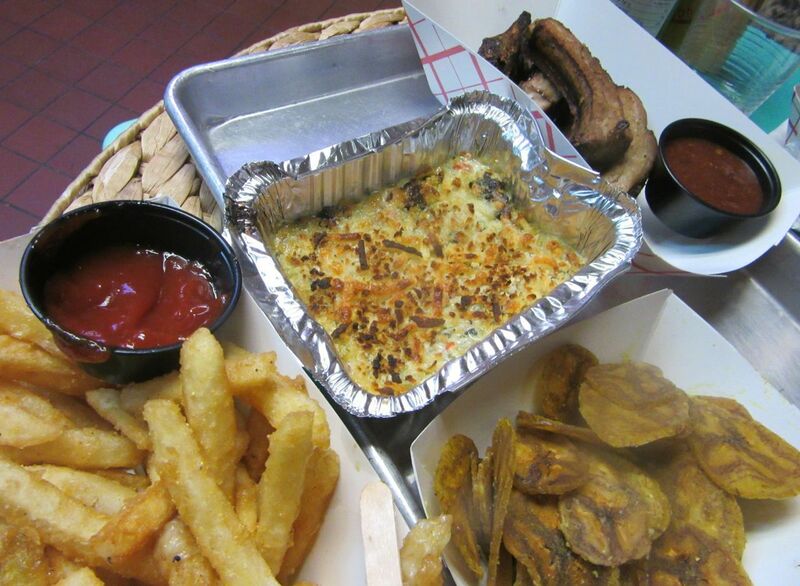 My free range harvest of the menu –crabby dip, ribs, plantains, garlic fries -- starts arriving. We grab house made plantain crisps to scoop up gruyere and callaloo-fortified “crabby dip,” and tuck into textured garlic fries -- very hot, surprisingly good. Just then, our fourth arrives, Tren’Ness Woods Black, (the granddaughter of Soul Food’s iconic Sylvia, for those who don’t know Harlem royalty). She apologizes for being late. I urge her to start with a Belizean conch fritter before they get cold. They already taste as if they've been rewarmed. Lime zest remoulade for moisturizing helps. Conch fritters with baccalao and lime zest remoulade taste baked and rebaked; the fries are top-notch. The waiter trucks up with a second wave from the kitchen. The jerk ribs are sedate, small and meek but not the smoked wings. 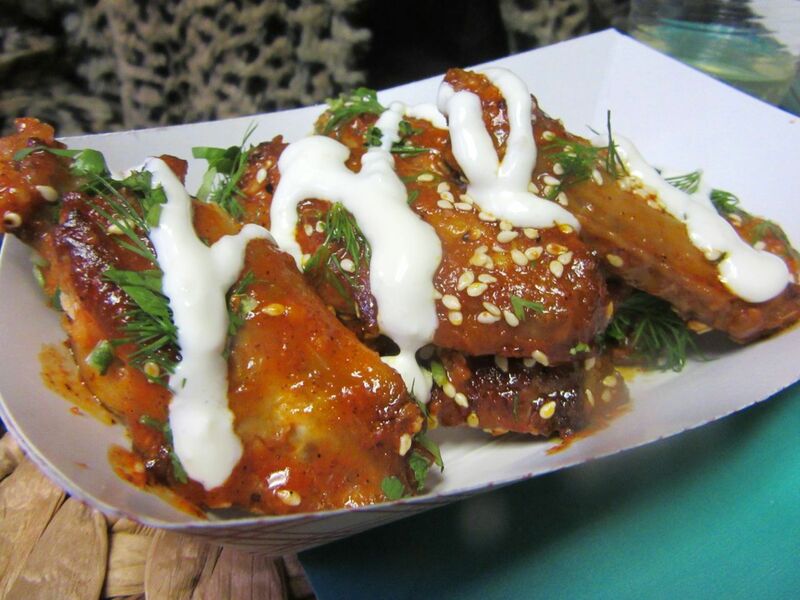 Sticky with achiote sauce and sesame seeds -- three-napkin wings -- they quickly disappear. 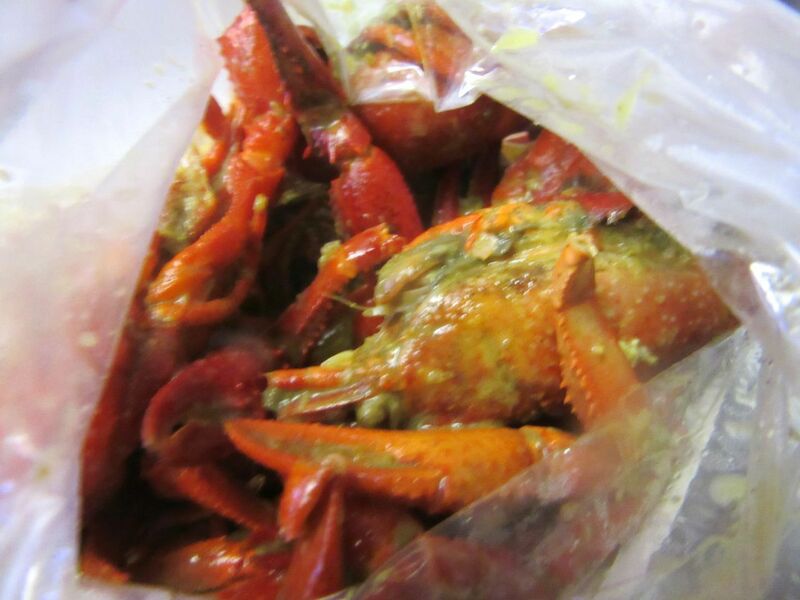 A tangle of small steampot crawfish in a garlicky butter bath gets delivered in a plastic baggy. The server seems embarrassed -- or just shy? -- as he offers blue plastic gloves for grease-free peeling. Personally, I find the critters too scrawny for the effort, and finish off the last wing instead. An especially generous tip has the server eager to please but maybe he was eager to please anyway. About then, the imposing figure of a woman clearly in charge blows in like a hurricane. It can only be LoLo. Busy out back with the private party, she’s had no reason to notice us till now. “Tren’Ness, what are you doing here?” They hug. The formidable Leticia has imagined herself as a barefoot LoLo di Crab. Tren’Ness behind. LoLo di Crab, it seems, is not exactly a barefoot arrival from Trinidad or Jamaica. True, her father was Belizean (voila, the conch fritters). Leticia “Skai” Young, a graduate of Brearley, the French Culinary Institute’s Entrepreneurship program, and the Zuma Restaurant Group, is the curator of this Caribbean and Cape Cod mash-up. 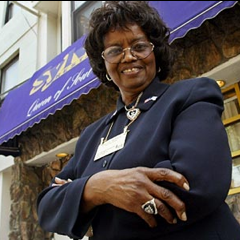 She introduces her husband the chef, Raymond Mohan, Guyanese, yes, but also a veteran of Vong the Coffee Shop and three-star Patria. Visions of these marvelous wings flash through my mind when dinner elsewhere disappoints. We’ve got to move to a spot worthy of Tren’Ness, she insists. Lolo persuades a handful of party guests to bunch up and free a table out back for us. It’s very dark, the music turned up full blast. I think the speaker must be just inches above my head. I don’t mind getting my fingers sticky but peeling these tiny crawfish is hardly worth the effort. 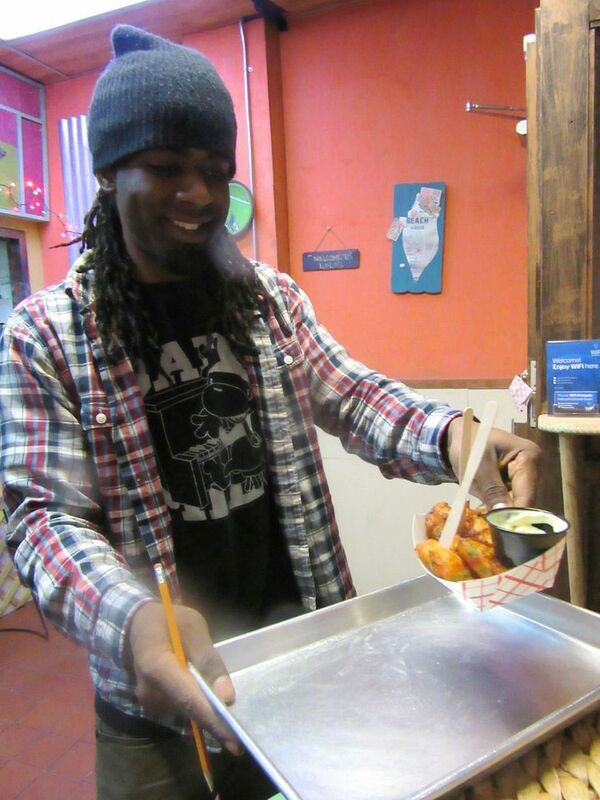 We must have fresh conch fritters and another order of wings, too. “Dutty rice,” broccoli salad and wok-seared cauliflower in garlic crèma crowd onto the table. Decent-sized steampot shrimp soaked with parsley and garlic butter in their little baggy are worth the peeling. Some might find johnny cake “bake” too dense but not me. It the Seafood shack’s signature. Have we tasted the Bake? What? We haven’t tried the house shark on bake? “That’s our specialty,” LoLo notes. Bake is made from homemade johnnycake, baked then fried – a staple of both the Caribbean and New England. A collection of small sandwiches soon dominate the table. 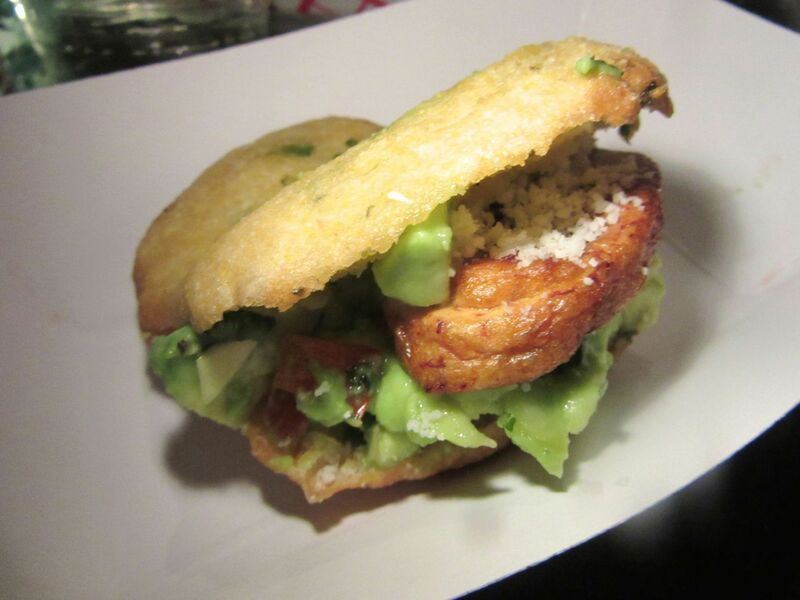 That’s the bake: crab cake, avocado with cotija cheese and honey butter, soft shell crab and bacon stuffed into rounds of dense doughy johnnycake. We can’t eat another bite. “That was fun,” we agree. 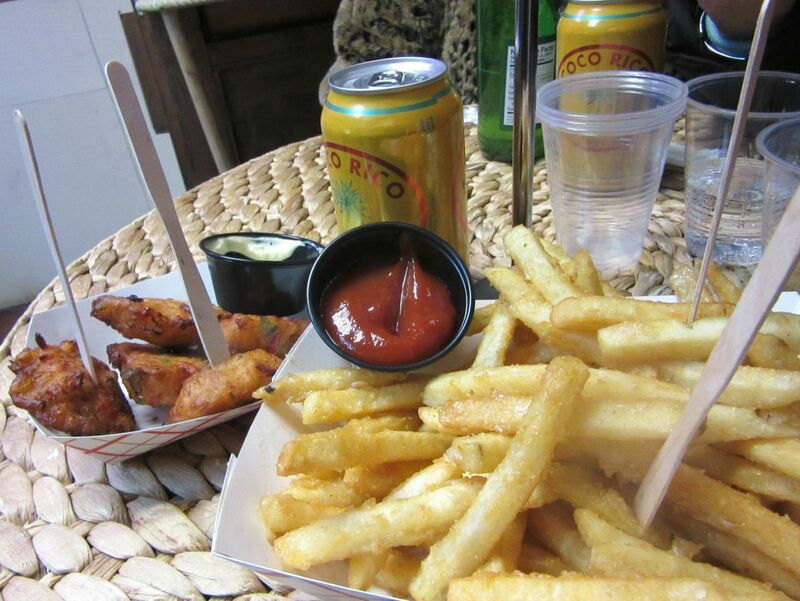 “Good grub and great gals.” A week on the beach in two hours. Have you been to the Caribbean. It always drizzles once a day. Add this wok-seared cauliflower with garlic crèma to your list of great ways to serve cauliflower. If you, like me, don’t go anywhere that doesn’t take reservations, you probably won’t be rushing uptown to LoLo’s. Or maybe that call of the bake will draw you. If you find the lone front table taken, you might just get some sandwiches to go and hike over to Frederick Douglass Boulevard and choose a likely spot on Harlem’s new restaurant row. 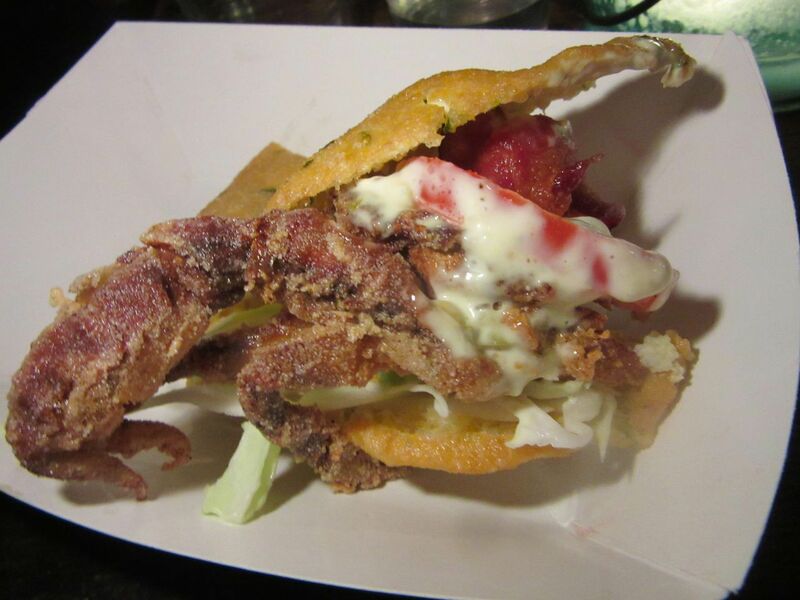 I wasn’t happy sharing the softshell crab four ways but truth be told I’d already eaten too much. 303 West 116th Street between Manhattan Avenue and Frederick Douglass Boulevard. 646 649 3356 Tuesday through Friday 4 to 9:45 pm. Saturday 3 to 9:45. Sunday 2 to 8 pm. Closed Monday. 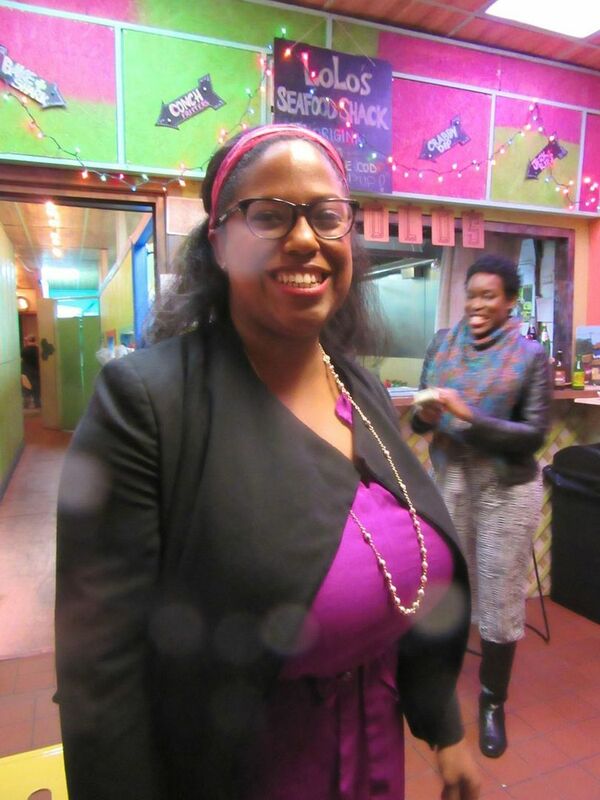 Join me at Harlem EatUp! Harlem EatUp! Sponsor Citi asked to recreate with chefs Art Kane’s 1958 50-year-old photo of jazz musicians called “A Great Day in Harlem. I’ve been following the restaurant explosion north of Central Park. If you read my BITE you would have been among the first to learn about The Cecil. And granted, I wasn’t first with news about BLVD Bistro, but I was just in time and not the last. Partly it’s the taxi challenge. It’s easier for me to get to 125th Street, east or west, than it is to cab or subway it down to Alphabet city. Certain of my dining out pals especially love exploring Harlem. But it’s also about keeping up with the action since Citymeals-on-Wheels has been chosen as one of two beneficiaries of the ambitious Harlem EatUp! Festival in May. The mayor, Manhattan Borough president Gale Brewer and Bill Clinton join festival producers Herb Karlitz and Marcus Samuelsson with Tren’Ness Woods Block at the launch announcement. 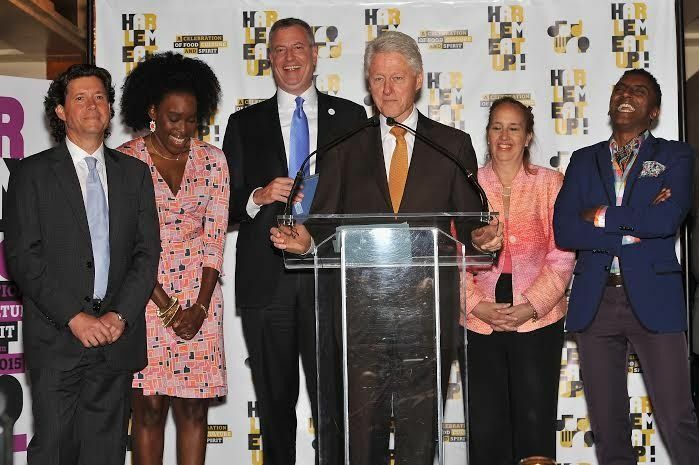 Organized by co-producers Herb Karlitz and Marcus Samuelsson, it launched with fanfare from the Mayor, the Borough President and Harlem’s first citizen, Bill Clinton. I feel you could trace most of the new commercial rush to Harlem from Clinton choosing to open his New York City office there. But I am not an expert on that. I’m just eating. Festival Players: Alvin Ailey dancer Hope Boykin, Daniel Boulud, Alexander Smalls of The Cecil and Mintons.. 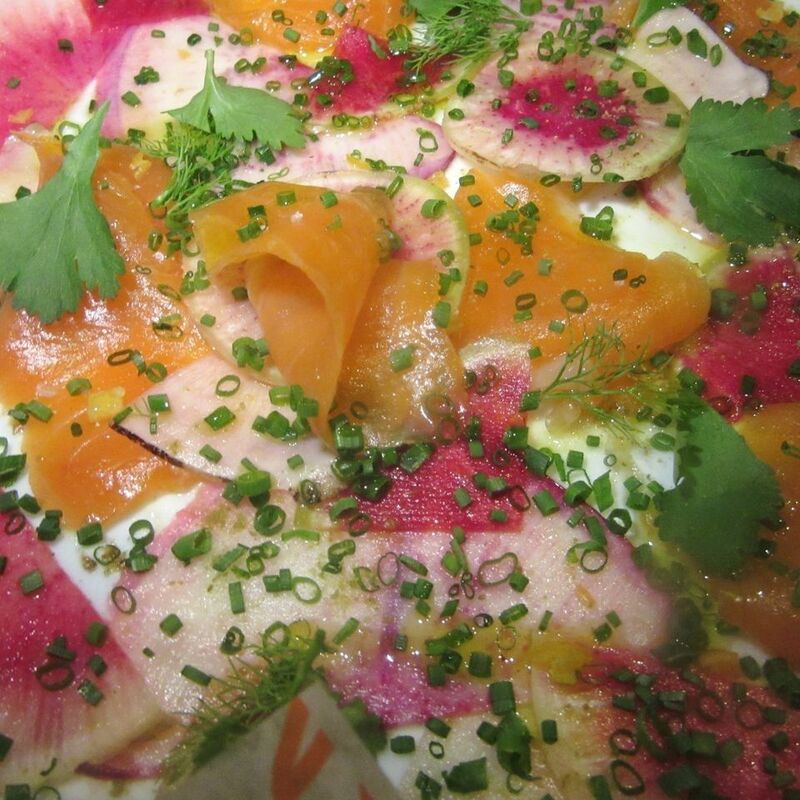 The festival -- a “celebration of food, culture and spirit,” as it’s advertised -- runs from Thursday May 14 though Sunday May 17th with private dinners and downtown chefs at uptown restaurants collaborating on dinners paired with performing artists and wines from Bordeaux. There will be free admission to The Avenue on Saturday, with specialty foods for sale and chef demonstrations. The Experience, also on Saturday, features four tents influenced by the art, the music, the style and the dance of Harlem. And there are special events for children on Sunday. The information below comes from the press release. 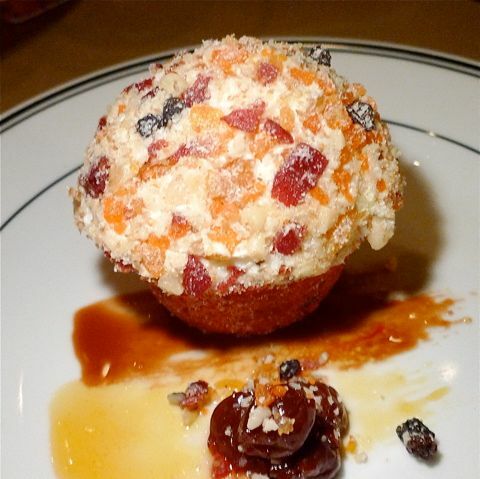 “Dine In Harlem” will pair select local Harlem chefs and restaurants (including The Cecil, Ginny’s Supper Club, Dinosaur Bar-B-Que, Jin Ramen, VINATERÍA) with national chefs who have personal ties to Harlem (including Carla Hall, Jonathan Waxman, Sean Brock, Paul Qu, Ludo Lefebvre) to collaborate on multi-course dinners. Each “Dine In Harlem” dinner will also highlight a dynamic selection of local performing and fine artists; dinners are $85 and $125; some restaurants will offer two seating’s. 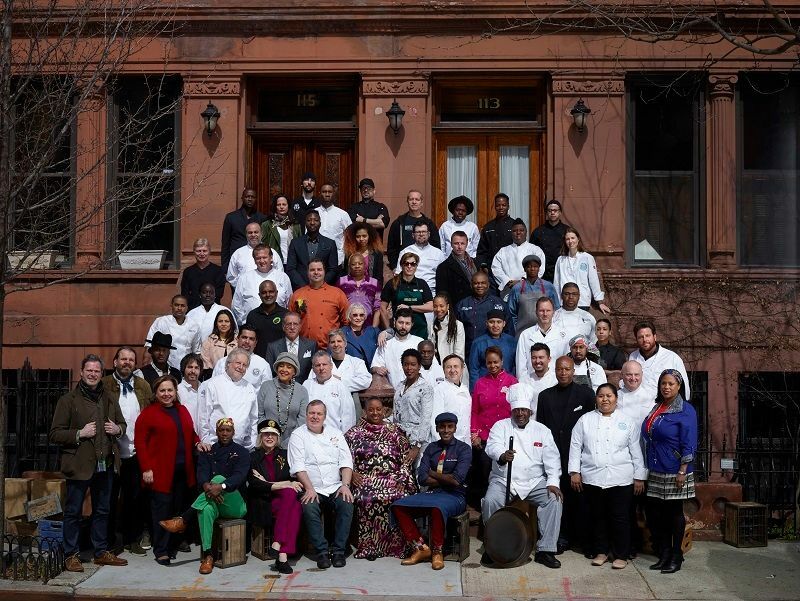 Bordeaux Wine Council is the Official Wine of Dine In Harlem. Saturday’s festivities will include “The Stroll” is comprised of “The Avenue” and “The Experience.” “The Avenue,” a free admission event open to the public, will include artisans and purveyors selling specialty foods, and exciting culinary demonstrations from acclaimed chefs. “The Experience” will feature four tents influenced by the art, the music, the style and dance of Harlem, and will showcase local artists alongside Harlem restaurants presenting tastings of signature menu items beside wines, beers, and spirited drinks. Additionally, “Harlem Talks” will feature celebrated tastemakers and leaders discussing relevant topics ranging from food and culture to business and the arts. “A Sunday Afternoon in Harlem” will feature Harlem restaurants selling their tastiest fare sold a la carte; tasting tents featuring wine, beer, and spirits; local artists; a sports area; a performance stage featuring live Gospel music from Mama Foundation for the Arts under the direction of Vy Higginsen; DJ Stormin’ Norman; a Yoga session from Land Yoga and more. The day will be rounded out with a Kids’ Zone, offering interactive activities for all ages, including storytelling, healthy eating activities, and more. This event will be free admission, and will offer an EATS package that includes food tickets, and a SIPS pass for the beverage tents. As part of its mission and dedication to Harlem, net proceeds from festival ticket sales will be donated to beneficiaries Harlem Park to Park and Citymeals-on-Wheels, two non-profit organizations that have a positive and direct impact on the Harlem community.